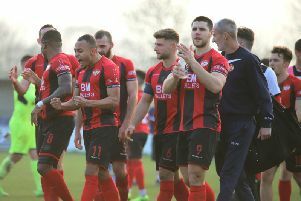 If you were to ask any Kettering Town fan to name their early contenders for the player-of-the-season award, then you could expect Gary Mulligan’s name to be on the tip of their tongue. The striker-turned-midfielder-turned-centre-back has been one of the star performers in what has been a fine start to the Evo-Stik South League Premier campaign. The Irishman has been rock solid at the heart of the defence, mainly alongside club legend Brett Solkhon, and they along with the rest of the back four and goalkeeper Paul White have ensured that the defensive frailties that plagued the Poppies last season have, for the time being, been eradicated. Mulligan also grabbed his first goal of the season last weekend as Kettering claimed a dramatic 4-3 victory at Farnborough to go back to the top of the table, before they dropped back down to second after King’s Lynn Town won 2-1 at Banbury United on Tuesday night. It’s definitely been a case of ‘so far, so good’ and, despite his own fine start, Mulligan insists he is still learning his trade as a centre-half. “I obviously played most of my career as a striker but when Thomas Baillie signed me at Kettering, he saw me more as a central midfielder and now I am in there at the back,” he said. “It is my first full season as a centre-back so, even at the age of 32, I am still learning new things and I am getting more comfortable with it. “I know there were a few people who questioned me and Brett as a pairing at the start of the season even though we hadn’t played together there on that many occasions because Dom Langdon and James Haran both played a lot at centre-half last season. “But we have been pretty good as a defensive unit right from the start of pre-season. The Poppies are currently in the middle of an enforced break from league action with no game this weekend. They head to AFC Rushden & Diamonds in the BigFreeBet.com Challenge Cup next Tuesday night before the league campaign resumes at Dorchester Town a week on Saturday. Marcus Law’s team have worked their way into a good position with just one league defeat so far and, as a result, Mulligan admits the target for the season has been altered slightly. “Our aim at the start was promotion,” he added. “But with the start we have had, our aim now has to be to try to win the league. “We just have to keep winning our games and see where it takes us. In the wake of the news that right-back Durrell Berry is facing a lengthy spell on the sidelines due to a suspected ruptured Achilles tendon, the Poppies last night (Wednesday) confirmed young defender Marshall Willock has had his loan from Chesterfield extended until December 10.